Last year, Feature Shoot launched The Print Swap in order to connect photographers from all over the globe. The concept is simple: Everyone is welcome to submit via Instagram using the hashtag #theprintswap or by emailing their images to us at [email protected] Outstanding submissions are selected to be part of the worldwide swap. Prints are mailed out to winners at random. Every winning photographer gives a print to someone else, and in exchange, they receive a surprise print at their doorsteps. Well over 20,000 photographers have submitted to The Print Swap to date, and more than 1,000 winners have shared their work with one another. 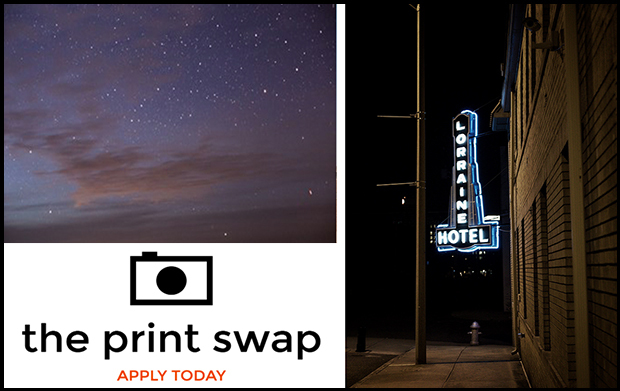 The Print Swap combines the convenience of the digital age with the timeless joy of physically collecting and displaying artwork, and we’re thrilled to announce that the first ever Print Swap exhibition will take place this summer at Photoville at Brooklyn Bridge Park, one of the largest annual photography events in the United States (and the largest in New York City). Last year, over 83,000 visitors flocked to the waterfront at Brooklyn Bridge Park to visit the 70+ exhibitions on view in Photoville’s repurposed shipping containers, which are transformed each year into modular gallery spaces. From July 1st until August 23rd, all new images submitted to The Print Swap will also be considered for the container exhibition at Photoville, which will be on view from September 13th to 24th, 2017. Around sixty images will be chosen, and the deadline is August 23, 2017 at Midnight to hashtag or email your images. To submit, simply tag your photos #theprintswap on Instagram or email your images (at 620 px wide) to [email protected] Please note that only new submissions will be considered for the exhibition. Images that have been submitted and chosen for The Print Swap prior to July 1st, 2017, will not be considered, though previous participating photographers are more than welcome to submit new images. As always, it’s free to submit to The Print Swap. Winners of The Print Swap pay a one-time fee of $40 per photo to participate. Winning images must be able to be printed at 8.5×11 inches. We cover all printing and international shipping costs. Learn more at www.theprintswap.com and follow along at @theprintswap on Instagram for updates.